Herbs have played an important part in medicinal history and were often considered the go-to remedies before modern medicine. This was certainly true of the herb, uva ursi. Until the discovery of sulfa drugs and antibiotics, uva ursi was a common treatment for bladder and related infections. It is listed in nearly all Pharmacopceias, and its medicinal use can be traced back to the 2nd century. Uva ursi is commonly referred to as bearberry, because bears enjoy eating the plant’s fruit. For natural health purposes, however, only the leaves, not the berries, are used in herbal medicine. As mentioned, the most common use for uva ursi is for urinary tract infections and bladder related conditions. In fact, uva ursi benefits the bladder and can help with conditions such as cystitis, nephritis, water retention, liver ailments, and chronic diarrhea. Over the years, through modern research, scientists have been able to uncover the components that make this herb effective for these types of treatments. Uva ursi contains a compound called arbutin, a glycosylated hydroquinone, which has the ability to drain excess water from cells, promoting an antiseptic effect on the kidneys. During its excretion, arbutin produces an antiseptic effect on the urinary mucous membrane and can therefore help assist with the urinary tract infections. Despite the presence of several acids in its makeup, uva ursi helps to keep the pH balance of urine from being too acidic. It actually strengthens the lining of the urinary tract and helps to ease any inflammation in the system. It has a direct sedative effect on the bladder walls. For chronic inflammation of the bladder or kidneys, uva ursi has no equal. Two studies report that urine from individuals given uva ursi is active against the most commonly involved microorganisms in bladder and urinary tract ailments. This study supports the results of a double blind study of 57 women with recurrent cystitis. After one year, the placebo group had 20% incidence of recurrent cystitis, whereas the uva ursi group had no recurrence. In addition, uva ursi has anti-lithic properties that help in dissolving crystals not just in the kidneys, but throughout the body as well. It has, therefore, been used for arthritis and other joint problems. 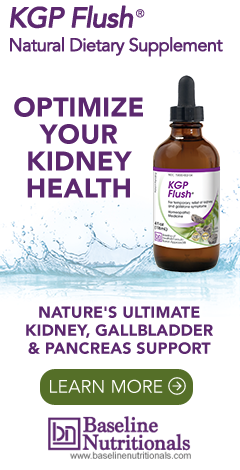 For these reasons, it’s probably no surprise to find uva ursi as an ingredient in both Jon Barron’s KGP Flush formula, a natural kidney, gallbladder, and pancreas optimization formula, and Liver Flush Tea, an herbal detox tea for liver cleansing. Uva ursi also contains diuretic chemicals, including ursolic acid, powerful astringents, and a chemical, allantoin, that helps promote the growth of healthy new cells and the healing of wounds. It also contains tannic acid, a phenolic acid, which is also found in nettles, tea, and berries. Studies have shown that tannic acid has a number of health benefits including anti-viral, anti-fungal, anti-inflammatory, and anti-tumor activity. Uva Ursi has been reported to be effective against diseases caused by bacteria such as E. coli, Proteus vulgaris, Mycoplasma hominis, Staphylococcus strains, and Candida albicans. One of the active ingredients in uva ursi, Allantoin, can be found in many over the counter creams to treat cold sores, herpes, and vaginal infections. Since it promotes urine flow, uva ursi plays a part in helping reduce bloating and water retention - two key elements in helping with weight loss. It can help promote muscle relaxation and help soothe and strengthen irritated and inflamed tissues. Uva ursi is most commonly available as a dried or crushed herb, capsule, or powder. It can also be taken as a tea. Note: uva ursi dosage should be watched carefully; it should not be taken at high doses or for prolonged periods of time and should not be taken by young children, pregnant or nursing women, or those with severe liver or kidney disease. For more on how uva ursi can be used in a formula to strengthen the lining of the urinary tract and as part of a kidney detox, click here. I have Uva Ursi for a UTI; will it do any good for a gum infection? For obvious legal reasons, we cannot diagnose or prescribe for specific medical conditions, merely provide information. That said, check out this article: https://jonbarron.org/article/gum-disease-forest-not-trees and search our site for articles on "oil pulling."